Leslie Chew spent his childhood working long days next to his father on the oil rigs of southern Texas. No school meant he never learned to read or write. Now in his early 40s, he’s a handyman, often finding a place to sleep in the back of his old station wagon. But he got by — until one night in December 2008 when the station wagon got cold, and he changed the course of his life. When I first spoke to Chew last summer, he’d been inside the Lubbock County jail since the night he was arrested: 185 days, more than six months. Chew is like one of more than a half-million inmates sitting in America’s jails — not because they’re dangerous or a threat to society or because a judge thinks they will run. It’s not even because they are guilty; they haven’t been tried yet. 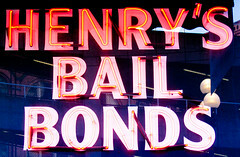 They are here because they can’t make bail — sometimes as little as $50. Some will wait behind bars for as long as a year before their cases make it to court. And it will cost taxpayers $9 billion this year to house them. via Bail Burden Keeps U.S. Jails Stuffed With Inmates : NPR.